Materials: Poster board, backing board, dry mount tissue, commercial chromogenic prints on resin coated (RC) paper, self-adhesive laminate sheeting. Photographs had been dry-mounted to small pieces of board, which had in turn been mounted to a larger sheet of board covered with construction paper. 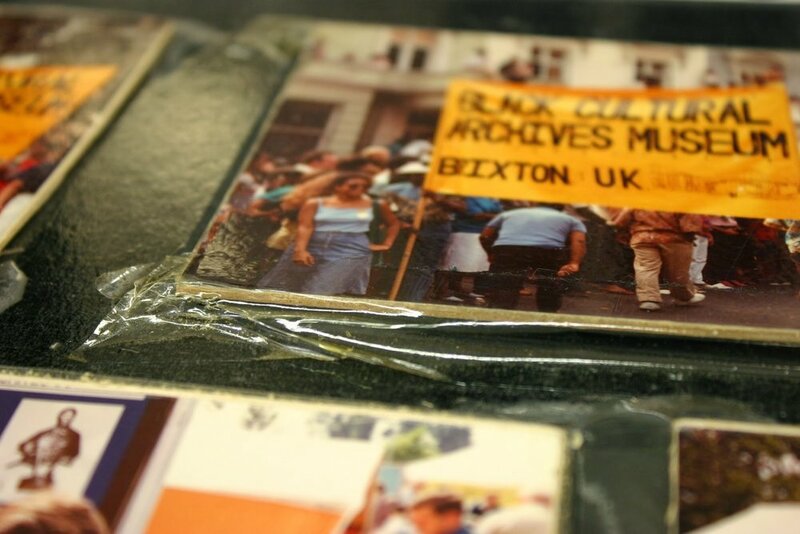 [Note: as the institution wished to remove the photographs from the larger board, treatment was not carried out on the board itself and it was discarded.] The sheet of self-adhesive laminate which covered the majority of the photographs was peeling off in places; where it had come away from the surface of the photographs and board, a sticky adhesive residue remained. This residue had become quite dirty. The institution determined that the most significant part of the poster was the photographs and that the board itself was not historically significant. This made removing the photographs from the board significantly easier; the photographs and boards were cut away from the larger poster board with the laminate still attached to treat each individually. Backing removal was attempted first on individual photographs, leaving the laminate on to protect the recto of the print. The top layers of the board were removed by splitting it with a teflon spatula, leaving two layers of board and a layer of dry-mount tissue. 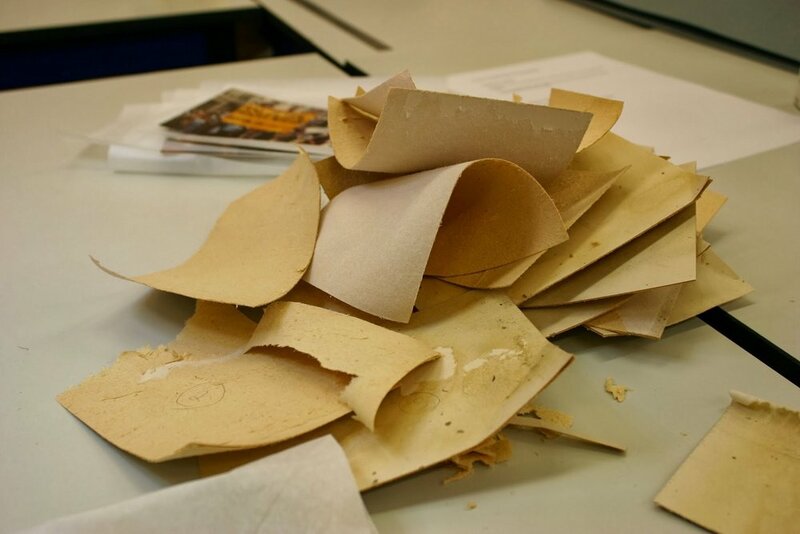 A scalpel and methyl cellulose poultice were used to remove the remaining layers of board, leaving a very thin layer of paper on top of the dry-mount tissue. Testing on the dry mount tissue with ethanol and a scalpel proved that removing the dry mount tissue would be exceptionally difficult. It was determined that the dry mount tissue layer would be left on the verso of each print rather than subjecting the prints to a solvent bath or something equally drastic. Methyl cellulose (3%) was used to gently adhere areas any existing areas of delamination on the verso of the prints. 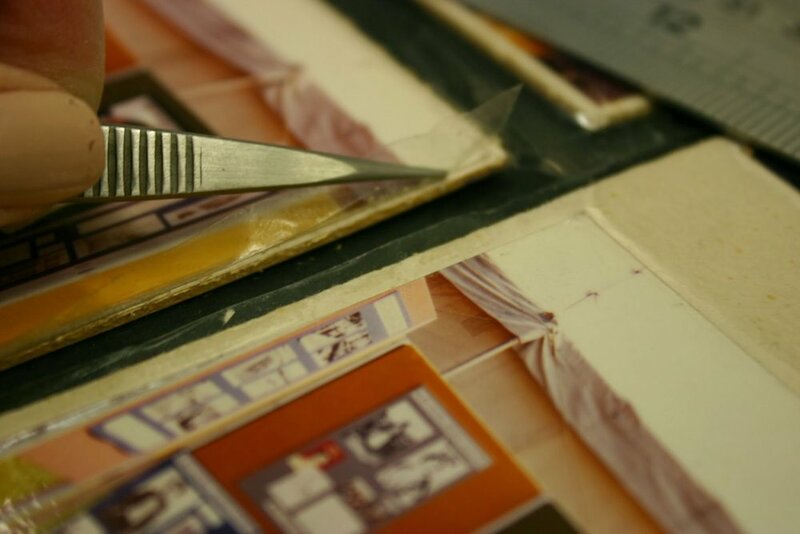 The laminate was very slowly peeled from the surface of each photograph, using a low peeling angle to remove as much adhesive residue with the laminate carrier as possible. Once the laminate carrier was removed, irregular areas of tacky residue remained. The first attempt at removal of the adhesive residue involved using a crepe eraser to nudge the adhesive off of the surface of the photograph. This was time consuming and carried the added concern of being too rough. Spot tests were performed with IMS (industrial methylated spirits/denatured alcohol) to check the sensitivity of the emulsion and the dyes of the prints. It was judged to be suitable and a cotton swab dipped in IMS and then rolled over blotter to remove the excess solvent was used to swab gently until the adhesive came off in small clumps. Once the majority of the adhesive residue was removed, a larger swab made from cotton covered in Japanese spider tissue was dipped in IMS, blotted, and swirled gently over the surface to remove any last remaining bits. Once prints were free of adhesive, each print was housed in a polyester L-sleeve and stored in an acid-free, PAT-approved archival box.